Protein, fat and some other essential elements are necessary for human body for maintenance of good health. The purpose of study was to estimate the amount of minerals and heavy metals in protein sources to be safe for human consumption.180 samples of six groups of protein sources like mutton, beef, poultry, fish eggs (yolk, albumin) were taken in study. Samples were digested by using method diacid digestion method (HClO4:HNO3; 1:3).The concentration of Na, K and Ca was analyzed by using Multi-channel Flame photometer (AFP 100) and the heavy metals including Zn, Pb, Fe, Cr, Ni, Cu, Mg and Mn were analyzed by using Atomic Absorption Spectrophotometer (Polarized Zeeman Z-8230 Atomic Absorption Spectrophotometer). The results were concluded that mostly the values of minerals and heavy metals were above the standard value. Ca in beef, mutton, chicken, egg yolk and egg albumin was observed (985.5 ppm), (1013.5 ppm), (810 ppm), (491 ppm) and (740 ppm), Na in beef, mutton, egg yolk and egg albumin highest value were found in egg albumin which was 1479.5 ppm, K in egg albumin, Zn in egg yolk and egg albumin, Mn in fish, egg yolk, egg albumin, mutton and chicken was above the limit and highest value was found in fish which was 18 ppm, Fe in the egg albumin, Cr in mutton, chicken, fish, egg yolk and egg albumin was above the limit and in fish was highest value which was 14.5 ppm while WHO value was 0.1 ppm and Pb in egg yolk, beef, mutton, fish were observed above the limit by WHO. The observed value of Ni in all samples was seen under the permissible limit. Mg seen in all sample was above the limit. Cu was not detected in all samples. Heavy metals; Minerals; Protein; Contaminants. By increasing the population and industrialization the shortage of protein also take place day by day. This shortage was seen more in developing countries than the developed countries. The 80-96 g of protein consumed by developed countries on daily basis . With the expanding of industrialization; heavy metals are deposited into the earth. These metals stay for all time since they can't be eliminated from the earth. They add up into the food and from food stuff, they eventually make their entry into the tissue. Harmful metal is characterized as that metal which shows extreme toxicological side effects at low levels . Heavy metals are categorized as: essential and non-essential heavy metals. Essential metals are (Cobalt, Chromium, Copper, Iron, Nickel, Zinc), and nonessential are (Arsenic, Cadmium, Mercury, Lead) . Animal feed and polluted environment in which animal inhale is responsible for heavy metal pollution in meat. For food safety and human concern the heavy metal contaminants in meat is of great concern due to the toxic nature of these contaminants even in minute quantity . Lead, chromium, mercury and arsenic are more toxic heavy metals and cause hazardous effects when human consume the contaminated food stuff. The residue of these contaminants after ingestion by animal had deposited in meat. Due to grazing on contaminated soil these heavy metal were detected in mutton and beef . Due to bioaccumulation and bio magnifications in food chain the meat is contaminated with heavy metals which are highly toxic to human health stated by Demirezen and Uruc . Protein, fat and some other essential elements is basic components of meat. For maintenance a good health and growth meat should be essential part of our diet plan. Due to direct exposure to contaminated water and crops the contamination transferred to animals. Other source of contamination is vehicle emission and dirty slaughter places. Meat sold by shopkeepers on road side or at open market. Food and water which is polluted is a source of illness. In humans heavy metals are directly cause of health diseases . Along with other microelement meat is also one of rich and suitable source of protein. Poultry has shorter time of production of meat rather than red meat animals and the demand of it in world increase. Compare to other meat products the poultry meat used widely because of its relatively low and reasonable prices and its nutritive property . Zinc is essential heavy metal which plays important role in proper working of cells, protein and carbohydrate metabolism, normal growth and division of cells. When a high amount of Zinc consumes by human can cause default protein metabolism, damage the pancreas and can cause arteriosclerosis. Chromium is another heavy metal which is essential and beneficial and play role in use of sugar, protein and fat. Consumption of chromium at higher level can create different diseases in human body like can cause gastrointestinal bleeding, necrosis of proximal and distal tubules in kidney. Nickel is also important for human health. It helps as cofactor for many enzymes and speed up the chemical reaction in human body. But in high quantity it can cause eczema which can arise on other parts of body. A high consumption of Nickel can cause teratogenic and genotoxic effects . To build the level of proteins distinctive metals are added in poultry feed to nourish them so that the utilization of protein in human diet is inadequate and it's likewise in getting weight and counteractive action of diseases. The feed contained supplements like, phosphorus; copper; zinc; Manganese; and arsenic to increase growth and reproductive rate. Arsenic is very toxic heavy metal which creates different issues, because of its widely consumption 60 g/person/day. People consume 1.38- 5.24 μg of this inorganic arsenic on daily basis . The growth, reproduction rate, mortality and physiological functions of fish has effected by toxic effect of heavy metals. Through gills, body surface and digestive tract the heavy metal enters into the body of fish. Biomagnifications, sediments, contaminated water and contamination in food web is also cause of deposition of heavy metal in fishes . On the other hand, eggs also contain a large number of heavy metals which is due to contaminated feed and polluted water. But still, there are some traces minerals which is very beneficial and nutritive to health . This study was conducted in Department of Environmental Sciences at University of Veterinary and Animal Sciences Lahore. The samples of poultry, mutton, eggs, fish and beef were collected randomly from different local markets of Lahore. The samples were classified in groups. Group: 1 was of mutton, Group: 2 was of beef, Group: 3 was of poultry Group: 4 was of fish ,Group: 5 was of eggs yolk and Group: 6 was of eggs albumin. 10 samples of each group were taken. Total 180 samples of protein sources like mutton, beef, eggs (yolk, albumin), fish and poultry meat were taken. The samples were kept in cold box till processing. The chemicals concentrated nitric acid (70% HNO3), and (65% HCLO4) in 3:1 v/v and distilled water were used to detect heavy metals like Ni, Zn, Cu, Fe, Mn, Cr, Mg. The samples will be initially digested by this di acid method in order to evaluate the concentration of heavy metals in the collected meat samples.1 g of sample was taken to perform chemical test. Di-acid digestion method was applied to find out heavy metals in meat by using HCLO4: HNO3, 1:3. In this method 1 g of sample was taken and 10 ml of di acid mixture added and heat for 150°C for 30 minutes .Then the temperature will rise to 250°C till the completion of reaction and vine green or colorless end point got. After digestion methods made 50 ml volume of digested samples and run on device (atomic absorption) to detect heavy metals (Nawaz et al.). Flame photometer (AFP 100) was used to detect Ca, K and Na and to detect other heavy metals like Ni, Mg, Zn, Cu, Fe, Mn, Cr, Pb atomic absorption spectrophotometer (Polarized Zeeman Z-8230 Atomic Absorption Spectrophotometer) was used in Figures 1-10. The present study was done to estimate the presence of heavy metal contaminants in protein sources. 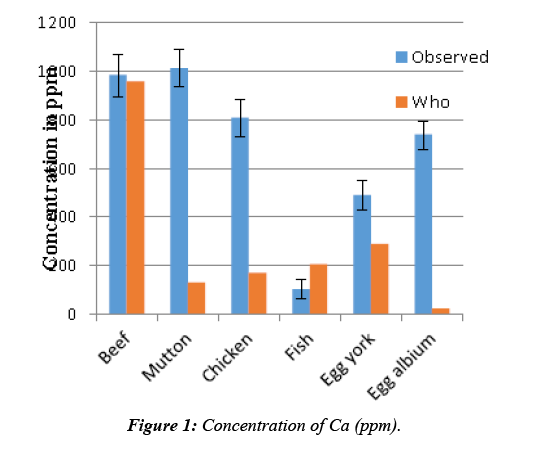 Figure 1 represents that the concentration of Ca in beef, chicken and egg albumin, egg yolk and mutton was found above the permissible limit. The concentration of Ca in fish was below the permissible limit. 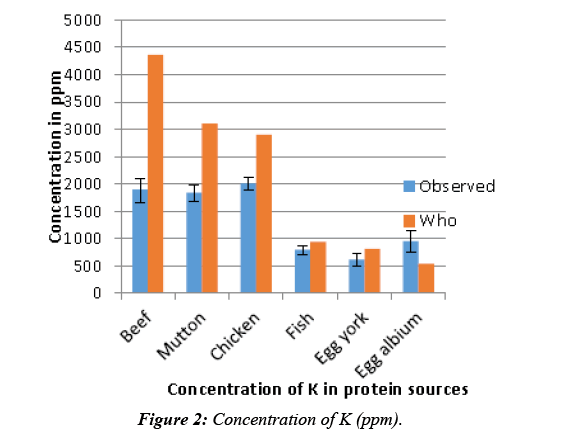 Figure 2 shows that the concentration of K in egg albumin was found above the permissible limit. The concentration of K in beef, egg yolk and mutton, chicken and fish was below the permissible limit. 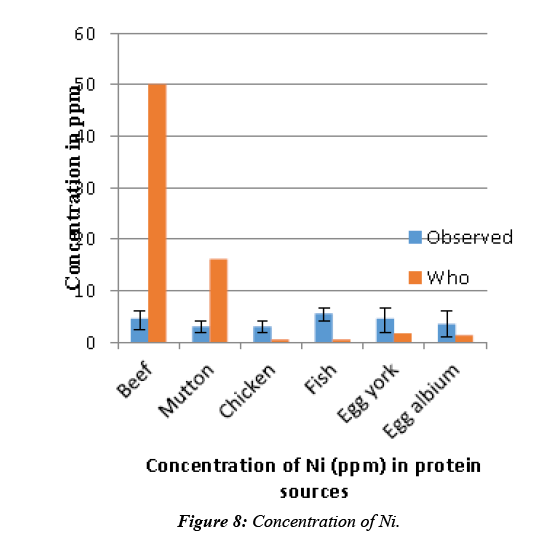 Concentration of Na represents in Figure 3 which shows that in beef, mutton, egg yolk and egg albumin Na was seen above the limit. While in chicken the concentration was below the limit (WHO, 1976). 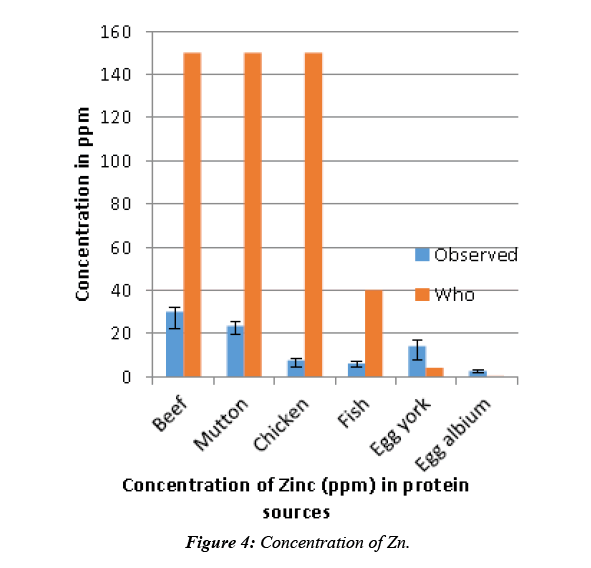 In Figure 4 the concentration of Zn in beef, mutton, fish, chicken was seen below the limit recommended by WHO. While in egg yolk, egg albumin concentration was above the limit value which was 0.3 ppm. 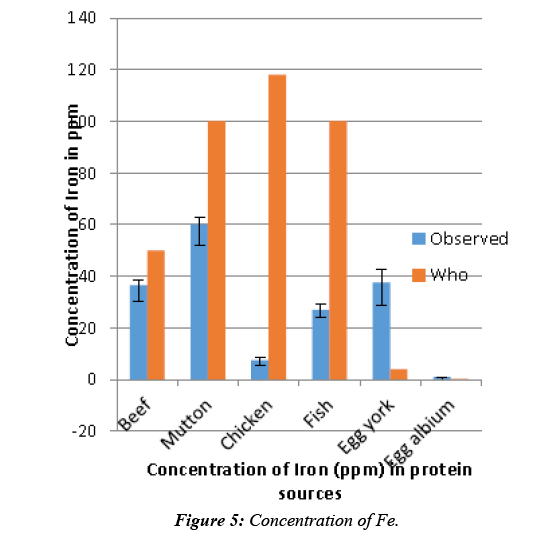 The concentration of Fe in beef, mutton, fish, and egg yolk was shown in Figure 5. The concentration of Fe in the egg albumin and egg yolk concentration was above the limit. The values of beef, mutton, chicken and fish were found below the limit. 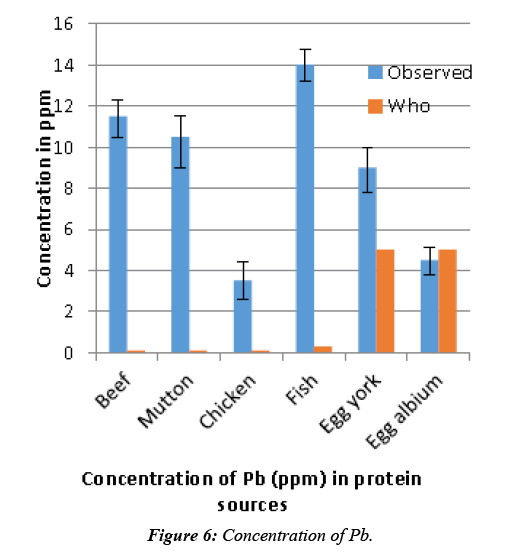 In Figure 6 the concentration of lead in beef, mutton, fish, and egg was seen above the limit but egg albumin was below the limit. 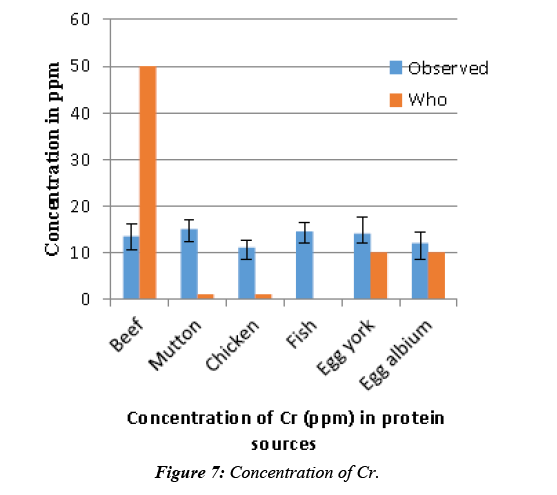 In Figure 7 the concentration of Cr in mutton, chicken, fish, egg yolk and egg albumin was seen above the recommended limit. While, in beef the concentration of Cr in beef was below the limit. In Figure 8 the concentration of Ni in all samples were seen under the permissible limit. The concentration of Mn in Figure 9 was observed in beef under the limit shown in graph. While in fish, egg yolk and egg albumin, mutton and chicken was seen above the recommended limit (WHO, 1976). 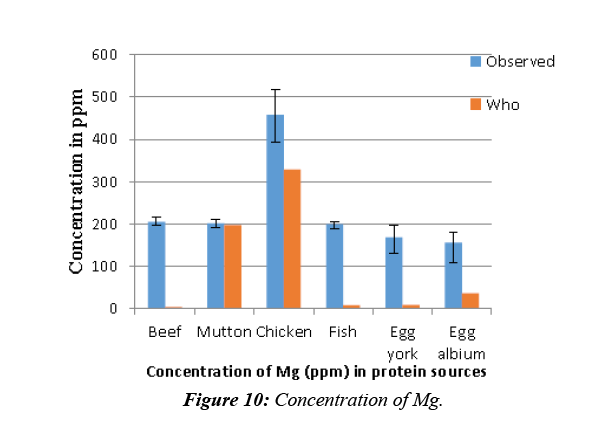 In Figure 10 the concentration of Mg in mutton, fish egg yolk, beef and egg albumin was seen above the limit. Figure 1: Concentration of Ca (ppm). Figure 2: Concentration of K (ppm). Figure 3: Concentration of Na (ppm) in protein sources. Figure 4: Concentration of Zn. Figure 5: Concentration of Fe. Figure 6: Concentration of Pb. Figure 7: Concentration of Cr. Figure 8: Concentration of Ni. Figure 9: Concentration of Mn. Figure 10: Concentration of Mg. Protein, fat and some other essential elements are basic need of human body. For maintenance of good health and growth protein sources should be essential part of our diet plan. Protein sources included mutton, beef, poultry, fish and eggs (yolk, albumin). With the increasing of industrialization and pollution the toxic heavy metals and other contaminants are deposited into the earth. They add up into the food and from food stuff, they eventually make their entry into the tissue of animals which are our source of protein. The results were concluded that mostly the values of minerals and heavy metals were above the limit by WHO were Ca in beef, mutton, chicken, egg yolk and egg albumin was observed (985.5 ppm), (1013.5 ppm), (810 ppm), (491 ppm) and (740 ppm) while (Sabir, et al.) reported that the concentration of Ca in fish and mutton was noted higher than limit. Na in beef, mutton, egg yolk and egg albumin highest value were found in egg albumin which was 1479.5 ppm, K in egg albumin was above the limit while (Mariam, et al.) reported the highest concentration of K 2.43 mg/g in meat of mutton and lowest concentration was 1.44 mg/g in kidney of beef. Zn in egg yolk and egg albumin was higher while (Mariam, et al.) found the concentration of Zn in lean meat of beef which was 66.26 ppm and in meat of poultry was 28.52 ppm. Mn in fish, egg yolk, egg albumin, mutton and chicken was found above the limit and highest value was found in fish which was 18 ppm, Fe in the egg albumin, Cr in mutton, chicken, fish, egg yolk and egg albumin was above the limit and in fish was highest value which was 14.5 ppm while WHO value was 0.1 ppm and Pb in egg yolk, beef, mutton, fish were observed above the limit by WHO. The concentration of Ni in all samples was seen under the permissible limit. Mg was seen in all sample was above the limit. Cu was not detected in all samples. Other samples contain heavy metals and minerals below the permissible limit. In protein sources the presence of heavy metal contaminants is a serious issue and need a great concern because these metals are highly toxic in nature and had adverse effects on human health. The direct exposure of these toxic metals is due to use of waste and drain water of industrial areas for irrigation of crops and by grazing of animals on these crops and soil these contaminants become part of animal body and by consumption of these contaminated animals these toxic metals enter in human body. The waste water of industries contain high amount of Lead and chromium which enters in our food. To avoid from these contaminants there should be provided clean and pure environment to animals like buffaloes, goats, poultry hens and fish and they should be fed on clean and pure water and food. Rehman KU, Andleeb S, Mahmood A, et al. Assessment of Heavy Metals in Different Tissues of Broilers and Domestic Layers 2012;9:32-7. Mariam I, Iqbal S, Nagra SA. Distribution of some trace and macro minerals in beef, mutton and poultry. International. Journal of Agriculture and Biology. 2004;6:816-20. Javed M. Heavy Metal Contamination of Freshwater Fish and Bed Sediments in the River Ravi Stretch and Related Tributaries. Pakistan J. of Biological Sciences Pakistan, Journal of Biological Sciences. 2005;8:1337-41. Jalil H. Determination of Heavy Metals in Exposed Corned Beef and Chicken Luncheon That Sold in Sulaymaniah Markets. Afr J Food Sci. 2013;7:178-82. Nawaz R, Rehman S. Analysis of heavy metals in red meat in District Peshawar Khyber Pakhtunkhawa. 2015;23:166-71. Demirezen O, Uruc K. Comparative study of trace elements in certain fish, meat and meat products. Meat Science. 2006;74:255-60. Sabir S, Khan M, Hayat I. Effect of environmental pollution on quality of meat in district Bagh, Azad Kashmir. Pakistan Journal of Nutrition. 2003;2:98-101. Mahmoud MA. Health Risk Assessment of Heavy Metals for Egyptian Population via Consumption of Poultry Edibles. Adv Anim Vet Sci. 2015;3:58-70. Ihedioha JN, Okoye CO, Onyechi, UA. Health risk assessment of zinc, chromium, and nickel from cow meat consumption in an urban Nigerian population. International Journal of Occupational and Environmental Health. 2014;20:281-8. Akan JC. Distribution of Heavy Metals in the Liver, Kidney and Meat of Beef, Mutton, Caprine and Chicken from Kasuwan Shanu Market in Maiduguri Metropolis, Borno State, Nigeria. Research Journal of Applied Sciences, Engineering and Technology. 2016;2. Rehman H, Rehaman A. Comparative Study of Heavy Metals in different Parts of Domestic and Broiler Chickens. Int J Pharm Sci Rev Res. 2013;23:151-4.